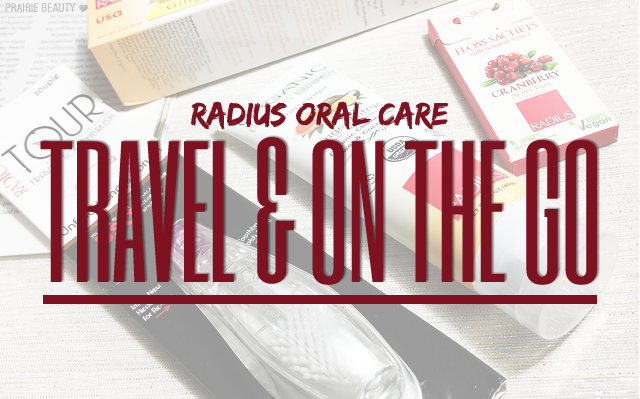 Last year, I got my hands on a Radius Travel Toothbrush* and I absolutely fell in love with it but I never got around to featuring it here on the blog, so when I got a chance to try a few more Radius oral care products, I decided that I was going to remedy that. 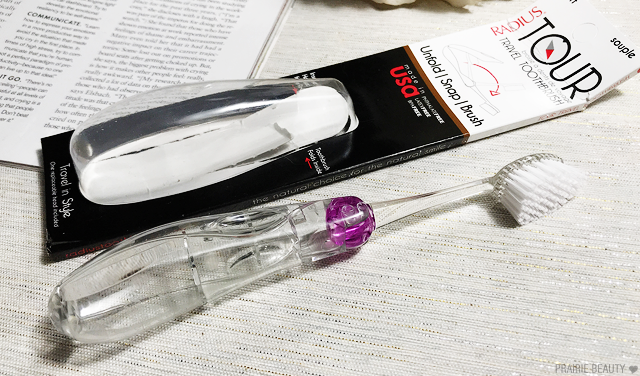 I feel like oral care doesn't get enough love, perhaps because it's pretty personal, but it's such an important part of health and beauty that I think it needs to get a little bit more attention... don't you? 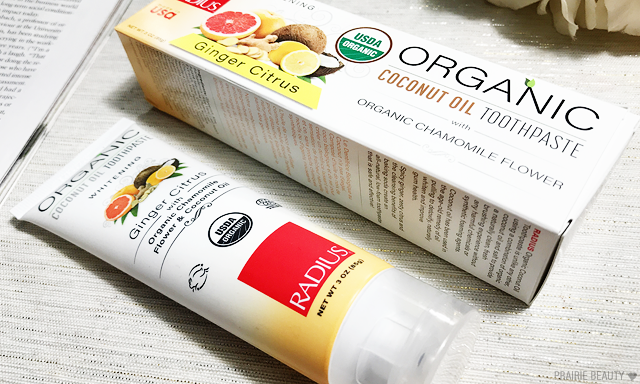 Keep reading to take a look at three oral care products from Radius that I've been trying out. I actually love the head of this brush even more than I love the handle design. It's got an absolutely ginormous head, which I feel makes getting a whole mouth clean easier because it's constantly reaching more of my mouth. Initially, before I used it, I felt like it might be too big and feel awkward or overwhelming in my mouth, but it really does feel great. 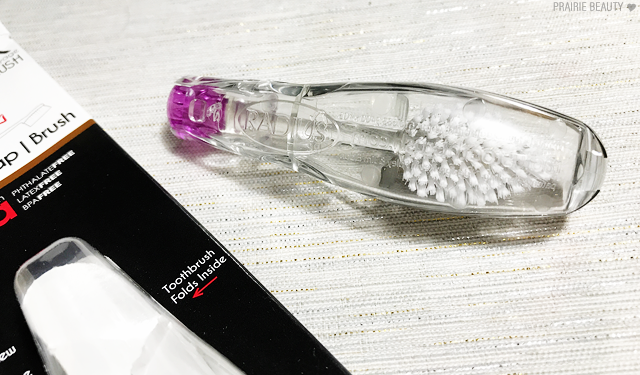 I also really love the size of the head with the softness of the bristles, because it gets everywhere and really gets your teeth clean, but the bristles are so comfortable that I never feel like it's going to irritate inside my mouth or cause damage to my enamel like some firmer brushes. Seriously, you guys, this brush is amazing and I'm basically dying to get my hands on the Radius Source Toothbrush, which has a handle made of recycled materials and replaceable brush heads. I literally can't say enough good things about this toothbrush and I think everyone needs one in their lives. I want to just be really up front when I tell you that I've never really fallen in love with a natural toothpaste, they just aren't my thing personally. Still, I wanted to review this because I know that for a lot of people choosing natural and organic products is important and I do think this is a good offering in the natural and organic category of toothpastes. The taste is surprising - clearly I'm used to all mint all the time - and I actually quite enjoyed it. There's a subtly refreshing hit to the ginger citrus taste of this toothpaste and I think that this could be a good option for someone who doesn't like a minty flavour to their toothpaste. It does a good job of cleaning the teeth and once I've finished brushing and rinsed, I feel like my teeth are adequately clean. The only thing that I didn't really notice was any significant whitening. Because I tend to use a traditional whitening toothpaste to deal with the fallout of all of the coffee I drink, I'm used to really seeing a difference after brushing, but with this I really didn't notice any difference. Overall, I think that this is a good offering that does its job in cleaning the teeth, it's just not to my personal taste and preference. We all have to be a little better about flossing... Unless you don't because you're super diligent about it, in which case, I want to know your secret. Anyway, I've really been trying to be more diligent about flossing so I was super excited about this little box of floss sachets because I knew that I would benefit from tossing a couple of them in my purse to have them whenever I need. Admittedly, I don't really know how to review floss, but I'm going to try. While I'm used to quite a slippy wax on my floss, the vegan camellia wax that coats these floss strips doesn't quite feel like it has the slip of the floss I usually reach for and I did have to get used to the feeling of it. When used between my back teeth, which are quite tightly spaced, I did find that it didn't glide quite as easily. The texture of the strip itself is... unique, I have to say. Radius describes it as "sponge-like" and I'd say that's fairly accurate. I find that once I've used a part of the floss, once it dries, it has split into a very unusual looking texture, but I don't generally find any significant difference in the way they perform. 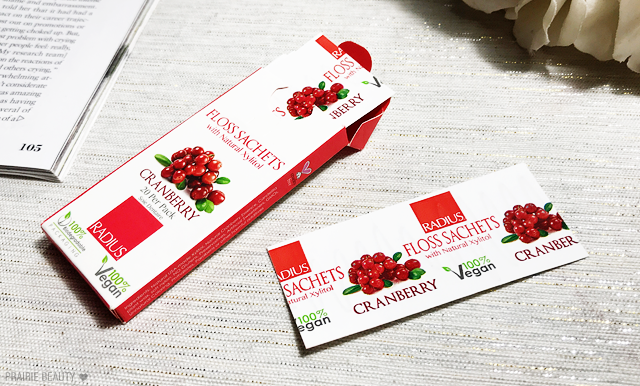 These floss strips contain xylitol and cranberry for flavour, which I have to say is really, really subtle, and also have the added benefits of preventing bacteria in the mouth to help prevent tooth decay. Overall, I quite like these. I think that the convenience of being able to throw a couple of sachets into my purse is probably my favorite part, but the floss itself is quite good also. Like I said... I don't know how to review floss! For me, I have to say that Radius has completely won me over with their toothbrush design and I'm absolutely dying to get my hands on the Source Toothbrush pretty much immediately because I honestly don't ever want to go back to another toothbrush. 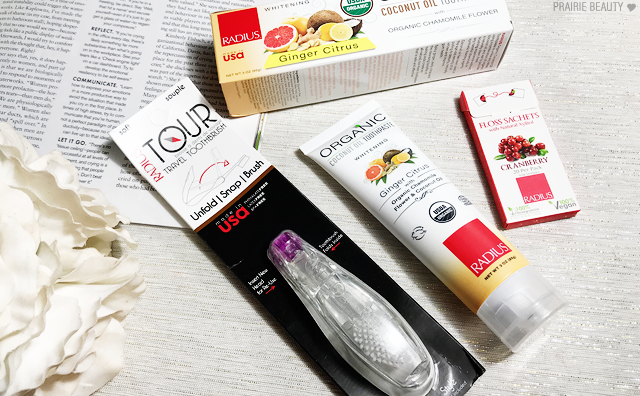 While they haven't quite won me over to natural toothpaste, I think that this is a good option for someone who does prefer to keep their oral care routine all natural, and I think the floss sachets are a great idea and a really solid product. If you're interested in trying any of these (seriously, try the toothbrush!) the full range of Radius products are available at Well.ca!